Revolution Slider Error: Slider with alias case_berklee not found. Berklee Brings Harmony to Connected Student Management. Berklee Online is the online extension school of Berklee College of Music, delivering access to Berklee’s acclaimed curriculum from anywhere in the world and providing lifelong learning opportunities to people interested in music and working in the music industry. Providing anywhere, anytime access to Berklee’s curriculum meant digital connectivity was essential to managing student enrollment, online communication, and ongoing support from staff and faculty. Berklee Online wanted to solve the connectivity challenge with a modern, agile approach that didn’t involve creating duplicate data across multiple systems. 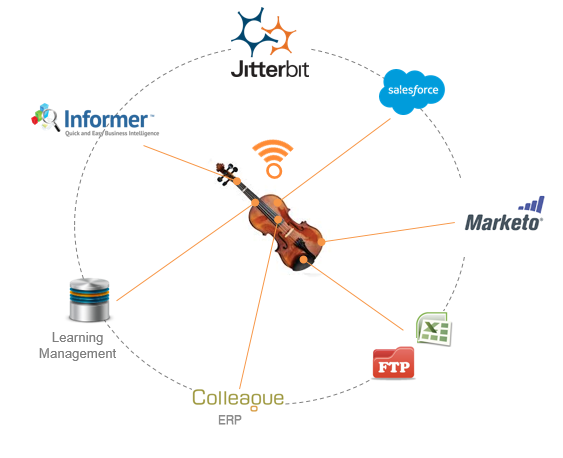 Enter Harmony, Jitterbit’s API integration platform, stage left. With Harmony, Berklee connects the Salesforce1 platform with Ellucian Colleague ERP and other in-house databases to provide a 360-degree view of their student body. Data connected from multiple systems can be accessed and displayed in real-time through APIs. With Harmony, Berklee has achieved a symphony of success: a connected, virtual campus where student information is always up-to-date and accurate. Legacy Monolithic system did not support agile processes. Siloed and redundant data locked in legacy apps and depts. Forced to create “copy” of data across multiple systems. Connected, best-of-breed services deliver modern student experience. Created a connectivity hub model across the college. Orchestration of student, staff, and faculty interactions across all devices. Centralized control of data eases maintenance of data flows.